DakPets has just launched their new Dog Hip and Joint Glucosamine supplement in Amazon UK. Available as chicken flavoured tablets, this supplement promotes healthy and free moving joints in dogs. DakPets is pleased to announce that their new dog hip joint and glucosamine supplement for dog joint support is now available in the UK via Amazon. A highly praised name in the global pet care market for their exquisite range of products, DakPets has formulated this product to help pet owners maintain mobile and pain free joints for their dogs. The supplement comes in packs containing one hundred and twenty delicious chicken flavoured tablets, and offers a potent combination of Glucosamine, Chondroitin, Green Lipped Mussel, MSM and more. DakPets Dog Hip and Joint Glucosamine tablets are now selling in Amazon UK for only £13.97. Dog owners looking to keep their pets full of vitality can make use of this discount deal by using the coupon code V8SUDL6B at checkout. As they get older, dogs tend to suffer from regular wear and tear of their joints and ligaments. This results in a serious negative impact on the pet’s overall mobility. It has been scientifically proven that a combination of glucosamine and green lipped mussel along with certain other specific ingredients can do wonders in terms of helping the dogs regain their complete mobility. DakPets has utilized eight carefully chosen nutrient enriched ingredients to support healthy joint function. 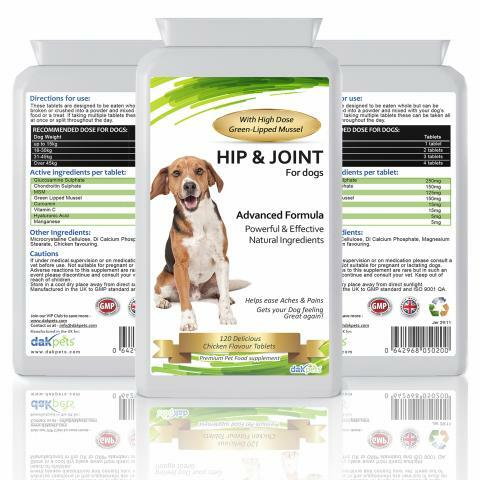 In addition to Glucosamine, Chondroitin, Green Lipped Mussel, MSM and Curcumin it also contains Hyaluronic Acid, Manganese, Di Calcium Phosphate, Magnesium plus vitamins C & E.
heir new pet supplement has been manufactured in the UK, and is GMP certified. DakPets claims that their new dog hip joint and glucosamine supplement is easy to administer and dogs love the product’s chicken flavour. Though the tablets are formulated to be consumed whole, it is also possible to break or crush them into a powder and mix with dog food or a treat. In addition to delivering world-class pet care products, DakPets is also known for their proactive service and customer friendly policies. As a part of the launch of the new dog supplement, the company is all set to introduce a series of special offers for the buyers. DakPets is a well-known pet care brand with an impressive range of pet care products. The company’s name is synonymous with high quality, exceptional value pet supplies. All their products are made and developed by professional experts that specialize in different breeds of dogs, cats, and even horse grooming tools and overall pet wellness.